Seriously, I have nothing against tags per se, they have their use but why does EL&U need that monolithic "Watched Tags" box on the right-hand side? The two boxes take up so much S…P…A…C…E. 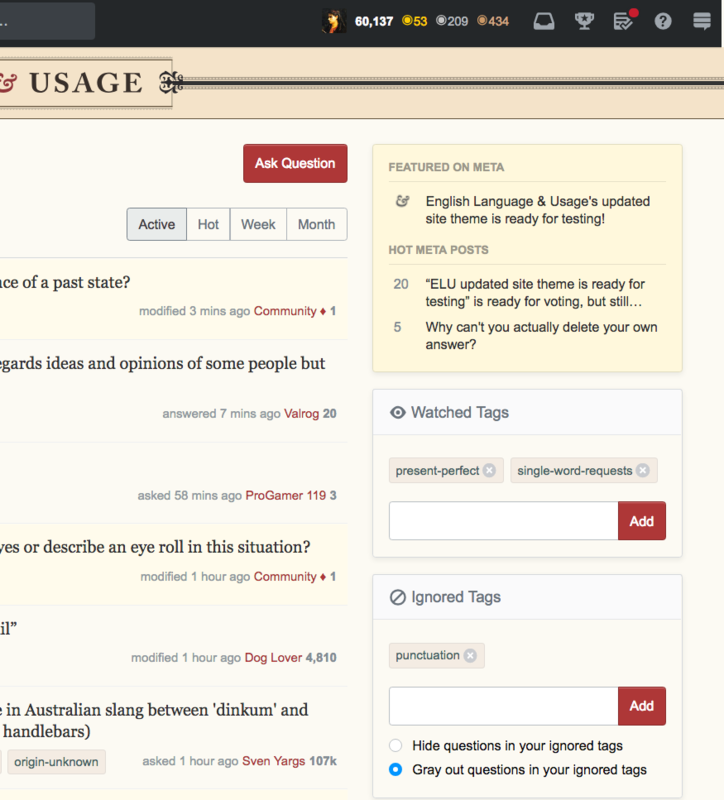 This is what users (will) see on the new theme when it rolls out. Can we get rid of those chunky binoculars, please? No one on EL&U is a tag watching enthusiast, this is not Stack Overflow. On EL&U (and ELL) tags are useful for categorizing but useless for discovering intriguing thought-provoking questions. Correct me if I'm wrong, I don't believe EL&U users select questions according to tags but on Stack Overflow they do. SO users answer questions on the programmes they specialise in. It makes sense that they have a list of ignored tags and can have the option of hiding questions they feel unqualified to answer. But what about users who are not active in the following communities: Stack Overflow, Code Review, Cross validated, Math Overflow, Mathematics, Server Fault, or Super User? What about the users in the other 160+ sites that do not exploit or track tags in the same way? Can you see which questions are highlighted above? How many users even know that graphic element even existed? Wouldn't those tag filters be put to better use on the page that is actually dedicated to tags rather than being permanently on display? 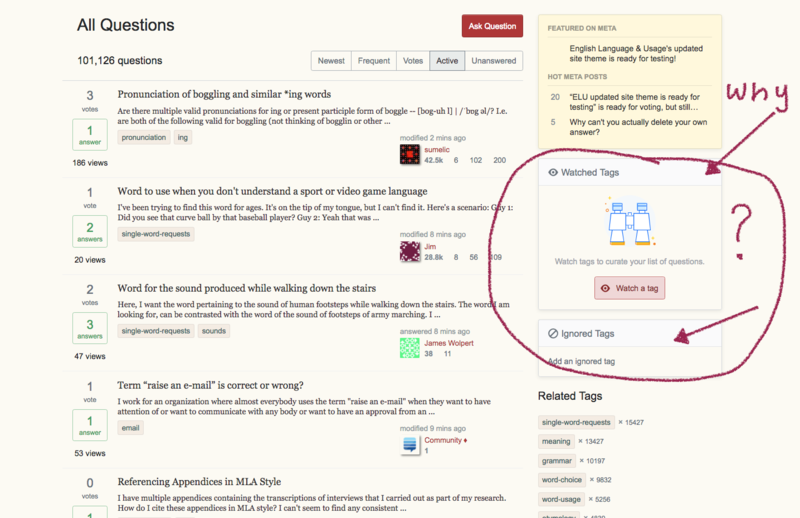 Here's an idea, place the "Watched Tags" and the "Ignored Tags" boxes on the right-hand side of the tag page. Would EL&U and ELL users miss the Watched Tags boxes on the main pages? Too long to post as a comment on MariLou's comment. I was intrigued by the statement "297 watchers of SWR tag is a pitiful number, it just proves my point that tags on this and on ELL's site has a limited use", and I thought some further (very basic) research on the top tags at a selection of SE sites might be instructive. From this limited selection, it seems that the proportion of users watching tags is roughly similar on ELU, ELL and Meta SE, but all three sites have less than a third of the tag-watching activity of Physics SE. My suspicion is that other "specialist" sites would have high levels of tag-watching as well. [Yes, sadly I'm consigning EL&U to the "generalist" category. It would be interesting to compare EL&U with Linguistics SE...]. Not the answer you're looking for? Browse other questions tagged discussion design theme-2018 .